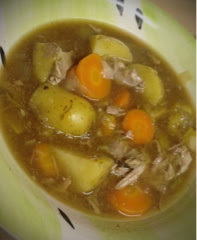 Slimming World Diary: SW Lamb Casserole in Slow Cooker .. I got given a slow cooker for Christmas by my lovely parents so I've been looking for SW friendly recipes to use when I came up with this one. The great thing about slow cookers is how easy they are to use and also how amazing the food tastes, the meat is always so tender, juicy and packed with flavour. Hence why I was wanting one for ages. So I just made a simple casserole with a few veg to see how it goes, I'm glad I did though because it was gorgeous, this recipe serves 4 people and is about 1 syn from what I can work out with the gravy granules, but you don't have to add them in, I did because I thought it was too thin. 1. Turn slow cooker on low and add the carrots, potatoes and leeks, cut any string off the lamb joint and place in middle of veg. Season. 2. Cover with boiling lamb stock, cover and cook for 8 to 10 hours. 3. When ready remove lamb carefully onto a plate and tear apart making chunks, remove some of the stock from the slow cooker and pour away. 4. Add the granules to the slow cooker with the veg still in and stir till it thickens slightly (if still too thin, add more granules just remember to syn). 5. Return the chunks of lamb and stir them in, then plate up. I served mine with a Weight Watchers Petit Pan (HeB) and some no added sugar mint sauce (free). If you do not have 8-10 hours, alternatively you can use it on high and the recipe will take 4-5 hours.